I love having great-looking, comfortable boots to wear when I am riding. 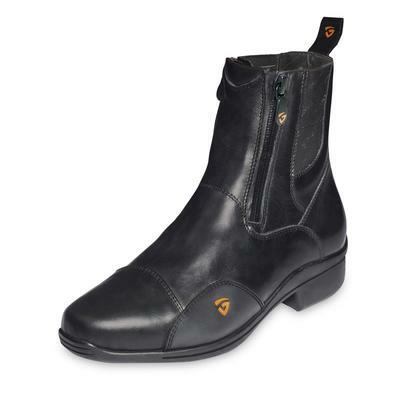 That's why I am so excited to share with you these Tonics paddock boots. Tonics is giving away a pair as part of our 2017 Horse Halloween Costume Contest! All you probably need to know is that they look gorgeous and are comfortable. Right? "Space“ unisex paddock boots brings the perfect symbiotic relationship between fine leather and functional advantages to meet highest expectations. “Space“ is equipped with a special breathable membrane which makes this shoe waterproof. At the same time it ensures a pleasant wearing climate. The X-Static inside mesh ensures high wearing comfort and has an anti-bacterial and odor inhibiting impact. The innovative abrasion protection in front and back and especially at the sides is not just an optical highlight but also protect highly impacted parts of the shoe from outer forces. That way the lifetime of the paddock boots is extended. Learn more at Tonics shoes. What do you think? Share what you like about these boots in the comments below!